Today, we have a guest post from the Queen of Easy Green, Lyndsey, who has got some marvelous tips for us to save energy and money. We recently had a Twitter takeover from Lyndsey as she discussed other energy saving tips with followers of @anglianhome; it proved to be a successful half an hour chat and I am sure our followers enjoyed the chat and will be taking the advice. “As you would have seen in the news, last week was Big Energy Saving Week, a week long, nationwide campaign of events, workshops and advice to help the nation’s households reduce their energy bills. Coordinated by the Citizen’s Advice Bureau, consumer groups, the Energy Saving Trust, Government, Ofgem and supported by funding from the six largest energy suppliers, the key focus of the campaign was to encourage households to check that they were on the best deal with their energy supplier, switch to a new supplier to get a better deal and insulate their home. In addition to this energy and money-saving assistance, sharing simple tips to help make our homes more energy efficient has also been an integral part of the campaign and as I advised, when I took over Anglian Home Improvement’s Twitter feed, it is these small day to day changes in behaviour that can have a positive, long term impact both on our energy bills and the environment too. As the Queen of Easy Green™ my main message is ‘Living Green, Loving Saving™’ as I am a firm believer that by choosing to live more sustainably, we can benefit financially too. Of course, these green changes have to be easy if we are to adopt them into our already busy lives and that’s what is so great about saving energy, it can be very simple. For example, by turning your heating down 1°C you will hardly notice the difference in temperature, yet it could save you up to £55 a year on your energy bills and reduce your carbon footprint. Likewise, by unplugging your mobile phone charger over night, you will effortlessly save energy and money. So what other easy green tweaks can you make to your daily routine that will reduce your energy bills and help you live more sustainably? Well, here are my top three daily living tips you may like to try. Dishwasher – to save energy and conserve water, forget the pre-rinse setting and only run when fully loaded. If possible use the ‘Eco’ setting and to save more energy, do not use the heat-drying option, instead choose the air-drying setting. If there is no air-drying setting, switch off after the final rinse and allow to dry naturally. Also consider where your dishwasher is located, if possible avoid having it next to a refrigerator or freezer, heat from the dishwasher will only make the refrigerator work harder (and use more energy). If it’s not possible to move the appliances, place a piece of foam insulation between them. Simply by switching from cooking in a conventional oven to using a microwave can save up to 50 of your cooking energy costs. This is because microwave cooking is faster, plus the energy is used to cook the food directly, rather heating the air in the oven and the utensils. Furthermore, by cooking vegetables in a microwave instead of boiling more nutritients are retained, as is their colour. 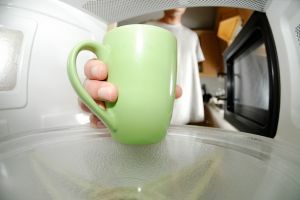 To save even more energy, remember to unplug your microwave after use.